The Nanai pantheon of the shamanic figures changes constantly. Some spirits lose their traits and others are forgotten for one reason or another. At the same time other spirits turn up and take their place. The present article deals with two categories of spirits-the helping spirits of the shamans, the sevens and the spirits of ancestors, former souls of shaman fathers and mothers, who were patrons of the clan. The following article examines the present-day role of shamen and traditional healers in the Republic of Indonesia, and how their respective trades are sustained by the stubborn persistence of essentially animist beliefs and practices within the archipelago. It goes on to describe the psychological foundation of certain shamanistic crafts and cures, and how they have, in many cases, been adapted to the demands of modern urban life with some commercial success. In recent years the basic ecstatic structure of shamanism has been questioned by leading representatives of shamanology. The following article undertakes a reassessment of the ecstatic elements in shamanism. It is concluded that if we wish to retain the concept of shamanism as a scholarly instrument we should stress its ecstatic character. Particular consideration is given to the meaning of ecstasy in shamanism. The Korean shamanistic ritual, called kut, is based on the principle of reciprocity which underpins most social interactions in Korean society. Analysis of the three groups of the participants, the spirits, the shamans and the sponsors, reveal a common denominator, i.e. grief or grievances. Kut is a festive gathering of mostly troubled beings, who exchange gifts of consolation with one another. Through venting and sharing their troubles, all of them experience catharsis, thus achieving ‘happiness’, which is the ultimate objective of kut, as its etymology suggests. An implicit faith in the Maussian obligation to reciprocate, therefore, is the essence of Korean shamanism. When faced with inexplicable disasters beyond modern science and technology, sponsoring kut is positive move by the sufferer to alleviate the pain and despair. Their belief that the spirits will reciprocate with blessing in return fir their gifts gives them confidence and hope, which helps them get over difficult times. The modern Korean people, therefore, will continue to sponsor kut not only for “joy of public giving”, but also for the solace that their faith in the spirits’ obligation to reciprocate brings them. The Sibe have practised shamanic ritual continuously up to the present day. In Chapchal today there are more than ten practising shamans, and new ones are being initiated. Two handwritten manuscripts, “shaman’s handbooks” have been discovered, they are, in effect, shamans’ teaching manuals. In this article I address several questions: 1) the “shaman’s handbook” 2) how shamans are chosen 3) the shaman’s mirror (toli) 4) the ladder of knives 5) the shaman’s ritual objects 6) sacrifice 7) the 18 karun and the shaman’s spirit painting 8) some names and other problems. Bashkir healing magic was little studied before the late 1980s, but recent years have seen a growth in interest and a proliferation of publications on the subject. 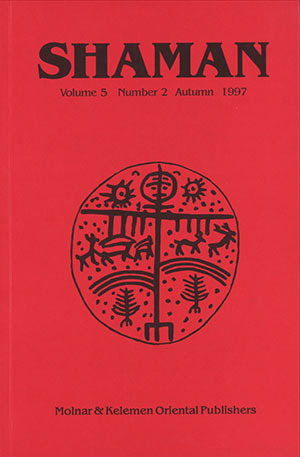 Based both on her own fieldwork and on hitherto unpublished data, the author discusses the Bashkir demons osoq, yelpew, sarpiw and büder, which are held to be responsible for a number of diseases. Consideration is also given to linguistic evidence and a wider Turkic context. 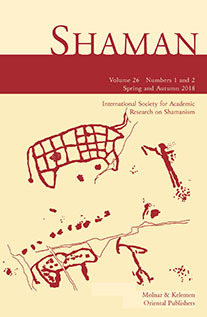 The article investigates the distribution of some central features of shamanism among cultures of Northern Eurasia and Native America. So far, little scientific attention has been given to the question whether, first, shamans remember the experiences and actions they have in a state of trance and, second, to what extent the way shamanic trance is induced influences memory and controlled actions during trance. As will be shown, investigation of shamanism is partly hindered by the usual anthropological bias of “mute anthropology”, as opposed to the method of “speaking anthropology”. The Manchu shaman performs dances whilst making offerings to the gods. Of these shamanic dance types two warrant special attention: 1) the “high deity offering”, alternatively called the “field” or “great deity’s dance” and 2) the “family deity offering”. It is these types of shamanic dances and in particular the former-during which the shaman attains an altered and heightened state of consciousness-which I intend to discuss in this article. The two dance forms documented in this paper are performed by the shamans of Manchu families residing in rural parts of North-East China and are still practised today.